Milwaukee comes out of hibernation every spring. As leaves emerge on trees and flowers bloom, residents stretch, put away winter clothes, and step outside to enjoy festivals, architecture, spectacular parks, and the ambience of a city that intensely enjoys its moments in the sun. It’s a perfect time to do your engagement photography. When Marie Claire magazine named Milwaukee the sexiest city in America in 2008, residents were surprised that outsiders recognized what a special place this is – but it was the warm-weather ethos of festivals and fun sealed the deal. 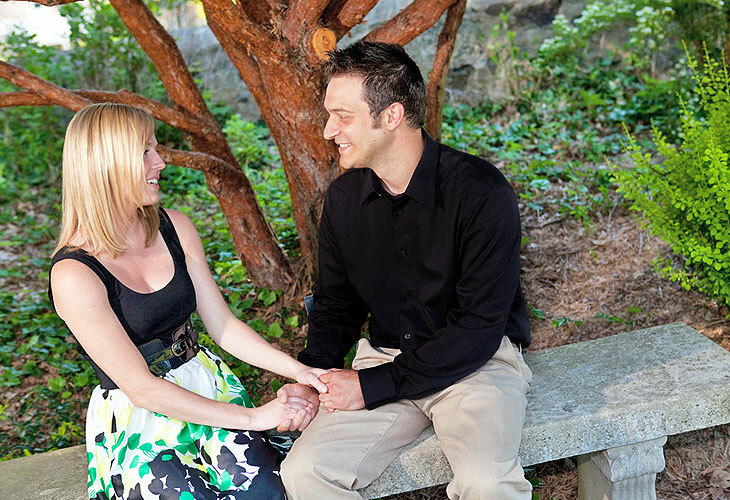 For your downtown engagement photo shoot, try starting at the Marcus Center for the Arts. The home of the Milwaukee Symphony, Florentine Opera and Milwaukee Ballet has plenty of dramatic, classy backdrops. Start in the Anello Atrium, with high ceilings, red carpets, stark stone pillars, and a glass-walled view of the busy cityscape. Up a flight of stairs and around the back is the secluded Fitch Garden, a hanging, enclosed outdoor space in the midst of the city. If you have a musical bent, pop into Uihlein Hall and take some photographs looking out into the auditorium, on the same stage where Lang Lang, Yo-Yo Ma, and the stars of Broadway perform. Next, walk across the State Street bridge over the Milwaukee River and get some beautiful outdoor shots in Pere Marquette Park. 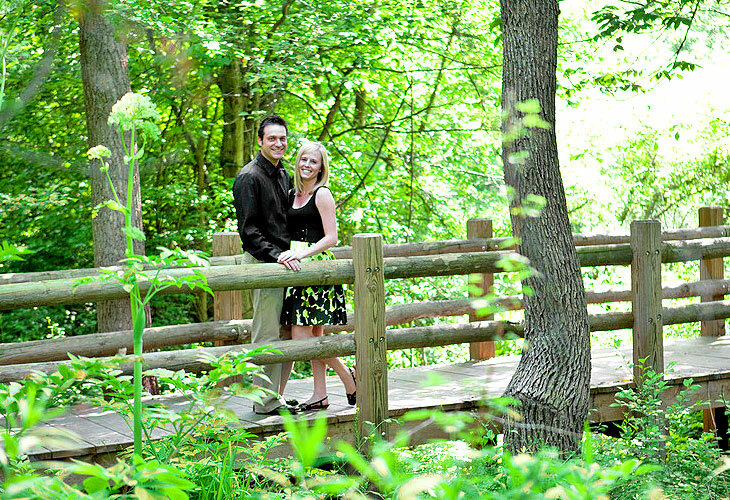 Named for Father Jacques Marquette, who in 1674 became the first white man to see what is now Milwaukee, this cozy little green space has a round, pillared stone gazebo that will make a great setting to commemorate your engagement. Your photographer can line up shots with the city skyline behind you, with some notable buildings including the Marcus Center, the Intercontinental Hotel, and Milwaukee’s ornate City Hall. You’ll also have the river as a scenic option – get some pictures on the broad concrete steps leading down to the water. On a sunny day, the light off the waves is a priceless backdrop, and particularly on weekends, you’ll have the option of lots of pleasure boats as part of the visual composition. Within easy walking distance is another statue of a much different Milwaukee icon, which couples with a fondness for pop culture must not ignore. Walk over the Kilbourn Street bridge, stroll a block south along the city’s beautiful river walk, and you will come to our newest landmark, the “bronze Fonz.” The life-size statue of everyone’s favorite arbiter of cool from the 1970s sitcom “Happy Days” was installed in 2008, after a minor civic controversy. Fortunately, reason and a sense of humor prevailed, and the city has embraced this icon of its blue-collar identity. 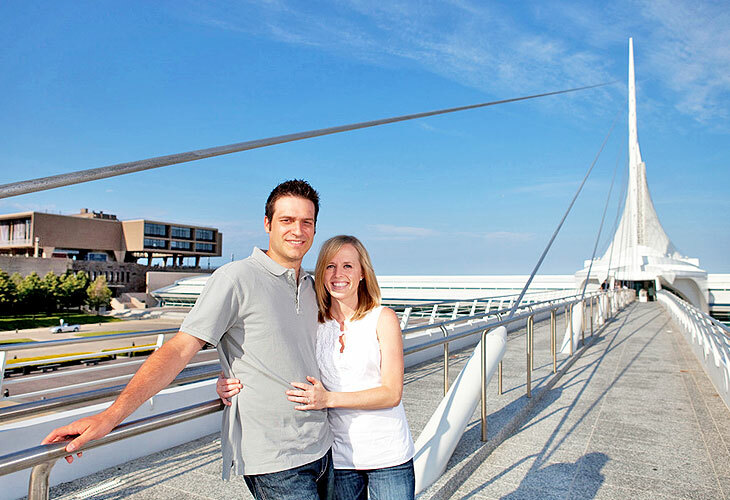 You can, too; let Fonzie celebrate your engagement in front of the Milwaukee River and the downtown skyline. After you’ve visited Milwaukee’s contribution to TV lore, walk one block along Wells Street and enter City Hall, one of the most splendid spots for a photo shoot in many, many miles. The atrium for this 1895 Flemish Renaissance gem stretches upward for all of the building’s six stories, with balconies, railings, and architectural craftsmanship from a bygone era on every floor. There’s no limit to the possibilities that an engaged couple and a photographer can create in this space, whether it’s looking up or looking down, from one floor or from six. Also, don’t ignore the portico that covers the space in front of the main doors – stand in front of the semicircular stone arches and you’ll be framed against the Pabst Theater or the urban streetscape. The stunning terra-cotta exterior of the building and its graceful bell tower will not be seen to best advantage in its cramped, wedge-shaped city block. Better photography is possible from a block or two away, such as looking north on Water Street or at the northern edge of Pere Marquette Park. At the latter, if the photographer swings around about 90 degrees, you can have the quaint and charming storefronts of Old World Third Street behind you – and pop into one of the street’s many restaurants for a hearty lunch after your morning of posing and smiling.